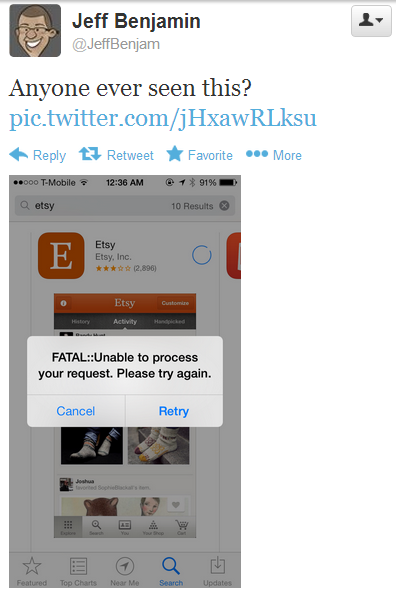 The very latest fatal iTunes error is being reported by a plenty of users across the country. Reportedly, Apple ID is unable to get logged on into the iTunes to make purchases. This is affecting and in fact frustrating holiday shoppers a lot. Fatal iTunes error – no Apple support so far! Over the past 12 hours, a lot of complains are coming in about an iTunes issue preventing consumers from logging on to the iTunes store. This very Apple support forum thread discussion is full with people complaining and some reporting otherwise. A plethora of other discussion forums have also popped up with tweets and complains spread all over the social networks too. This iTunes store glitch is giving a FATAL:: Unable to process your request. Please try again. message when you try to sign in to the iTunes store. Not all are facing this issue though, however, there is a big influx of complains coming in. While some users are getting positive Apple Support feedback with Apple accepting it’s some glitch at their servers, others aren’t that lucky. I, too, created an email case. They ask that we give them 24 hours to reply. I have tweeted Tim Cook, as others suggested earlier in this thread. Someone retweeted my tweet, so between Twitter and all the discussions, it is getting out to the masses. Apple would be hard-pressed to say they are not aware of the problem at this point. Note: More than 2 million Facebook, Twitter, Yahoo, Linkedin, ADP, Google, and other accounts have been compromised, and some companies such as Twitter have responded by disabling the affected passwords. Not to spread rumors, but could this be part of the problem and Apple is flying low until they check things out? Just saying. – thread. Password reset doesn’t seem to be curbing the issue too. Macs, iPad, iPhones – this iTunes glitch seems to be completely platform independent and so more chances of it are being originating from some server at Apple’s end.